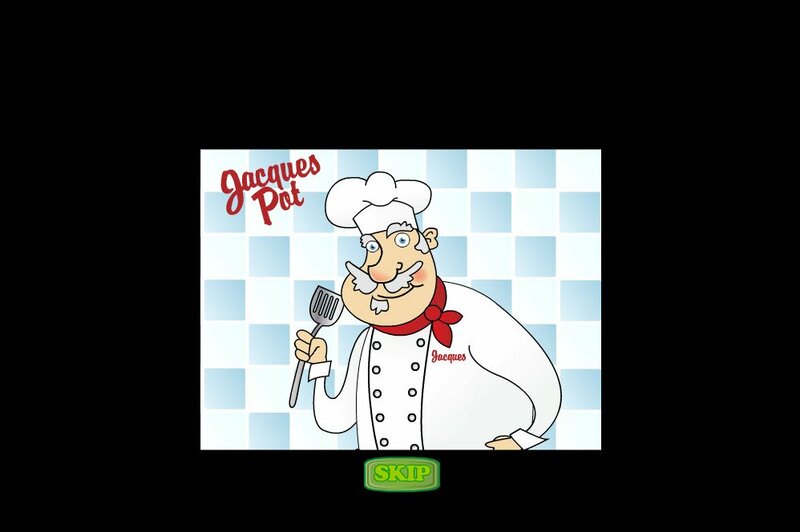 Jacques Pot Gourmet slot will have your taste buds tingling at the food he is about to cook for you. Reeling the raw ingredients around in this 5 reel, 20 payline slot, you will be hoping it will magically cook it and come up with a delicious dish as a result of all your hard work. Instead you will be able to net yourself a nice stack of coins, which you will undoubtedly use to whisk yourself off to Paris for a real gourmet meal. Food, lots and lots of absolutely, deliciously, mouth-watering food - Chef Jacques has the recipe for success. 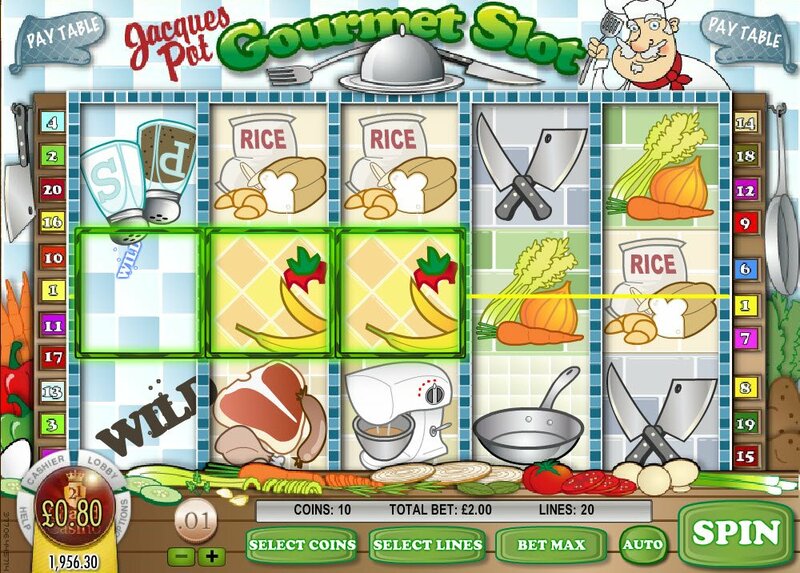 I do not recommend playing this slot around mealtimes as, you will without a doubt, find yourself wanting to eat your screen, especially during the first part of the video slot Jacques Pot Gourmet slot. When it comes to Rival Gaming slots like Jacques Pot, I usually really enjoy the music far more than the graphics however, I will recommend you turn your speakers off or volume right down before opening this slot game. The music is absolutely dreadful and feels like my head has been turned into a microwave and is busy popping never ending popcorn. The noise reverberating right through my skull with no sign of stopping or slowing down! When you spin connecting vegetable symbols, a knife will pop up and expertly chop them into little bits, all ready for your next meal. The food on offer is divine, pizza, chocolate cake and many other tasty titbits. The reels themselves are full of the raw ingredients for the chef to start preparing the feast. When you spin connecting vegetable symbols, a knife will pop up and expertly chop them into little bits, all ready for your next meal. Similarly with the saucepans, they will fill with some sort of sauce for sauté and, cutlery will spin crazily when matched with 3 or more symbols. 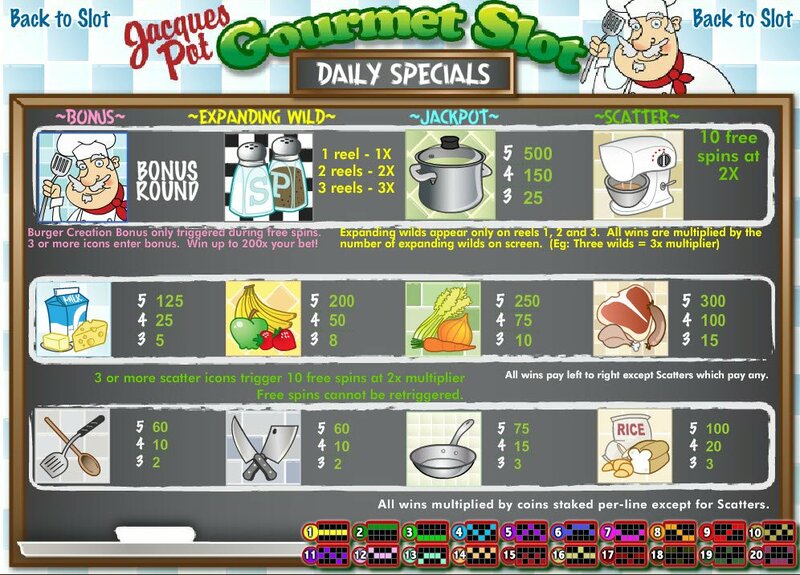 The 5 reel, 20 payline Jacques Pot Gourmet slot will also see all the other ingredients and pots and pans animate themselves to help show you that you have hit a payline. What chef's kitchen would be complete without some serious chopping and cutting knives, mixing spoons, and all your basic ingredients? Fruits, vegetables, rice, milk, butter, eggs and cheese are all accounted for here. There's also a nice selection of meat and sausages. The big, bubbling pot of soup will give you your 500 coin Jacques Pot Gourmet slot jackpot and, the automatic mixer will delight you with 10 free spins at a 2x multiplier. The ever essential salt and pepper shakers are your expanding wild that will multiply your winnings the more you spin. Chef Jacques himself, brandishing a spatula type utensil (I spend my time playing casino games online, rather than cooking in the kitchen) is the key to our bonus round where you will create your very own gourmet burger.